As the agent of Fashion Designers - Sidumiso Tshuma of Shadow By Sidumiso and Sheenah Moyo of BlinQ, we are delighted to inform you on their participation in this year's African Fashion Week Toronto - Canada. This year's African Fashion Week Toronto features 21 Designers from across the world with big names such as the French clothing label - Mike Sylla and Botswana's Black Trash Clothing. The fashion week is scheduled for the 15th of August - 18th of August, with Zimbabwe's Sidumiso Tshuma and Sheenah Moyo showcasing on the 18th of August. The 2 Zimbabweans are part of the 3 representatives from Southern Africa that will be showcasing at the event that will be held at the Japanese Canadian Cultural Centre. Shadow By Sidumiso is a clothing label established in 2004 and founded by Sidumiso Tshuma. The name Shadow comes from Tshuma's school days when he used to be called by such because of his dark complexion. Instead of mopping around and losing his self esteem, Sidumiso took the name as his brand and demonstrated how one can embrace their uniqueness and sale it to the rest of the world. Shadow by Sidumiso which has became a household name in the Fashion circles of Zimbabwe, has gone as far as being appreciated by Miss Earth Zimbabwe 2012 at the International finals, worn by Zahara, ZiFm's Loch Nation, Miss Zimbabwe 2010 - Samantha Tshuma, Global Citizen/Public Personality - Gilmore T. Moyo and 5fm & GoodHope FM Playlisted Dj - Sonny Jermain, amongst many. 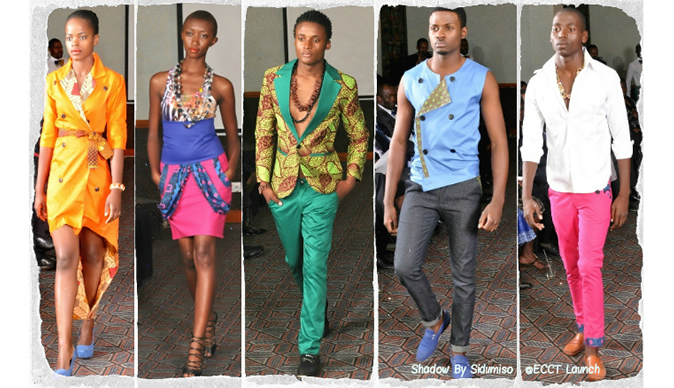 Shadow by Sidumiso has featured at many different platforms such as the Jewel Magazine Designer Pop Up Party, Vic Falls Carnival 2012, ECCT Fashion Show 2012, The CoFFashion Event 2012 and many more. The brand has been growing from strength and will continue representing Bulawayo, Zimbabwe at all levels. BlinQ is a button work accessory label established in 2012 by Sheenah Moyo, a 32 year old jewelry designer. The label appreciates the little, yet unique things that we take for granted as society, and brings life to them. Her works have been worn by ZiFm's - Tinotenda Katsande, Bulawayo's Sweetheart / Public Personality - Mbo Mahocs, Dj Eltonic and is breaking through all barriers. Sheenah Moyo has had her label being featured at the HIFA 2013, Pop Up Designer Party by Jewel Magazine and also ECCT Fashion Show in Harare 2012. Because of their uniqueness and use of outstanding materials in creating products that are eye catchy, both Shadow By Sidumiso and Blinq Jewelry have been invited to showcase at the African Fashion Week in Toronto, Canada this year. As their agent, we are excited to be sending out this write up to inform Zimbabwe on their progress.